I was back at The Great Kabab Factory in Chennai, this time for a business lunch. 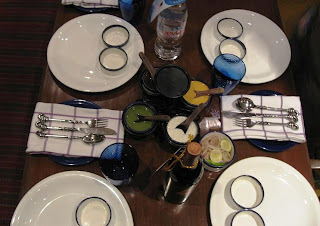 For those who are unfamiliar, this concept restuarant was a trend setter that has been much copied since it was first introduced in the New Delhi Radisson Hotel. Designed to look like a factory - waiters in factory uniforms, heavy-duty cutlery, unlimited kababs flowing to the table, etc. 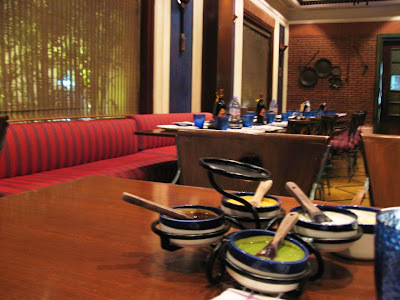 - this restaurant offers four different kababs, two speciality Indian breads, biryani and a dessert selection during lunch. The kababs change every day but always includes their signature Galouti Kabab. 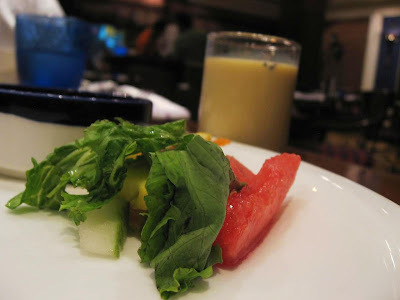 They started us off with a tropical salad of greens, fruits and strawberry dressing and a shot-glass of badam milk. The kababs began streaming in quickly after. The Galouti Kabab is made of very fine mince of mutton marinated in 123 different spices - or so they claim. 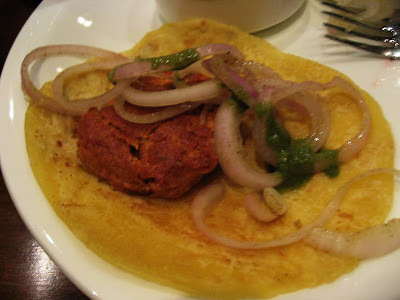 This delicate kabab was served with a Ulte Tawa Ka Paratha, a flaky Indian bread made with saffron milk. The waiter recommended spreading the kabab on the paratha, adding onion rings and mint chutney and rolling it all up like a kathi kabab. The kabab was mild, very flavorful and good as always. The Zaffrani Murgh, succulent chunks of chicken coated with red chilly powder, yogurt and saffron came next. This was was good, but not as juicy and tender as it could be. 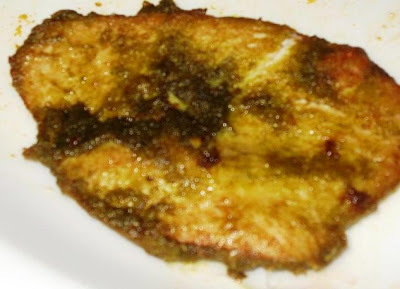 The Pudina Macchi, fillets of fish coated with spices and mint before being shallow-fried in a pan was excellent. They recommended using a peanut dip along with it, and the experience was wonderful. We ordered another round of this kabab as we sipped from glasses of Chaach, soothing buttermilk tempered with mustard seeds. 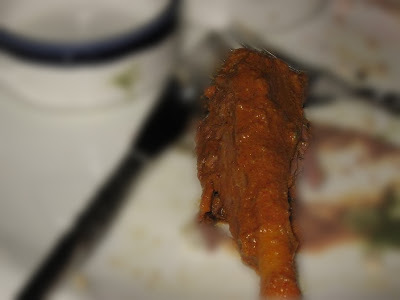 The last one was the Lagan Ki Nalli, shank with meat on the bone, marinated with almond paste and other spices. 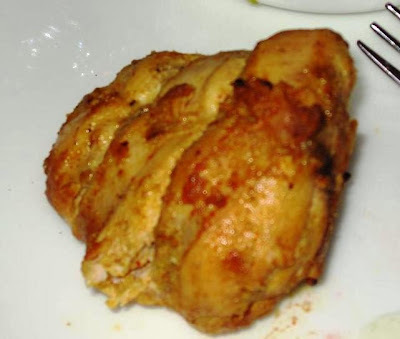 The meat was delicious, rich with the taste of almond, and easily fell away from the bone. Today's biryani was the Murgh biryani, cooked in the Awadhi fashion which is drier, less spicy but very flavorful. By now we were quite full. Among the desserts, the Pear Rabdi was excellent and a creative variation of the traditional one. Also in the sampler was vermicelli payasam, cham cham, beetroot halwa - another unique spin, this time on the more common gajar halwa. 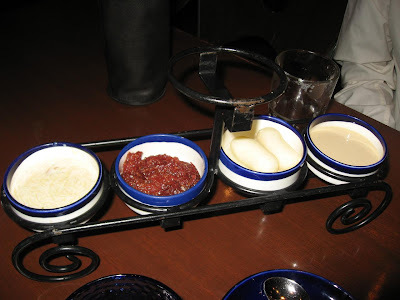 Finally, they served us small portions of kulfi in earthern pots. The Great Kabab Factory continues to delight and is a wonderful destination for that occasional craving for kababs. PS: My previous visit to TGKF is posted here. I have visited the TGKF in Gurgaon, and it was truly a treat! This was the first time I was having such a variety of kababs and in the widest of variety in the marination spices and techniques. The galouti is my favourite...Bangalore has Barbeque Nation and Cafe Masala ( BJN Group) on the same concept! Waiting for TGKF to set up shop in Pune. Fingers crossed. But what's kabab exactly? Because here, it's just meat on a skewer, and not even close to be that gourmet. On a un-related note, I'd really like you to review Trikaya Restaurant at Bavdhan. Shantanu, there are quiet a few new places you must have to explore in Pune, just for us! @Aathira: I love BBQ Nation too and I agree they are some things that are common with TGKF. However, TGKF is a kabab speciality place and the quality of their kababs are much better. @Vijayendra: Now that would be wonderful! Bombay Brasserie (now no more) had stolen/borrowed the Kabab Factory concept and brought it to Pune a few years back. @Nikita: For a kabab connoisseur, TGKF will rate higher. BBQN is a great place for a weekend brunch. @Zhu: At the very basic level, it is meat on the skewer. However, kabab (or kebab in Persian) is a variation that originated in the Persian region but is now entrenched in South Asia too. Kababs are made from a variety of meat and seafood, marinated with spices and then grilled in a charcoal oven. @Anu: Your wish shall be soon fulfilled - I just got back from Kolkata. @Vijayendra: I shall add Trikaya to my list now! @All: Thank you for visiting here! I know I haven't been regular in visiting your blogs lately but hopefully will get back to that routine soon enough.